Toasty-rich coffee beans sweetly accented with the flavour of buttery caramel. 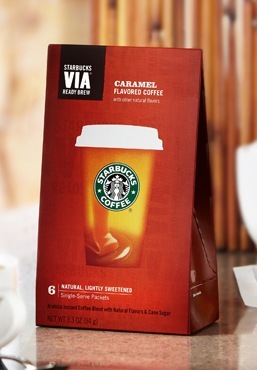 In an instant, you can enjoy the smooth, velvety caramel taste that comes in Starbucks VIA® Caramel Flavoured Coffee. Just open a packet of goodness, add hot water and enjoy. It’s really that easy. And we know you’ll love the soft, silky-smooth and oh-so-delicious flavour. Made from 100% arabica beans, a touch of sugar and natural flavours, this is the type of coffee you’ll want to keep drinking all day long. Tuscan biscotti and a room with a view.